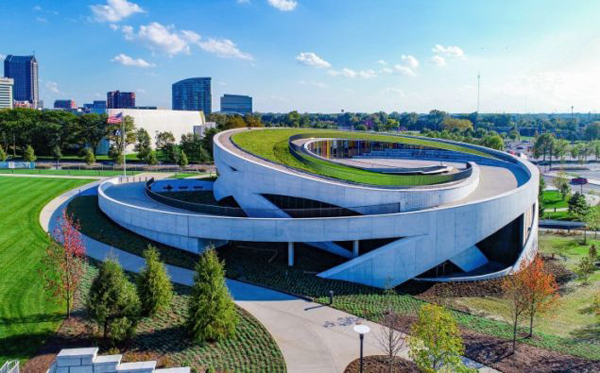 An aerial view of the National Veterans Memorial and Museum in Columbus, Ohio. National Veterans Memorial and Museum. Building a new museum to honor, commemorate or simply exhibit something that seemingly hasn’t received any or enough attention always sounds like a good idea. Perhaps that’s why we hear about a new institution on what feels like a weekly basis. In the second half of 2018, for instance, Jude Cook inaugurated the Ignite Museum, in Tucson, Arizona, to showcase his collection of neon signs, while Palestinian entrepreneur Faisal Saleh opened the Palestinian Museum in Woodbridge, Connecticut to present the work of artists from the occupied territories and elsewhere. Indeed, in 2018 alone we saw the opening of the Imagine Museum of contemporary American studio glass in St. Petersburg, Florida; the Legacy Museum that tells the story of African-Americans in the United States from slavery to mass incarceration in Montgomery, Alabama; the intelligence field-oriented Spyscape in New York City; the Carolina Music Museum of musical instruments in Greenville, South Carolina; the National Veterans Memorial and Museum in Columbus, Ohio; the National Comedy Center in Jamestown, New York (just a handful of blocks from the already existing Lucille Ball Desi Arnaz Museum) and the Nordic Museum in Seattle, Washington. Right at the end of December, they were joined by the Minnesota Museum of American Art throwing open its doors in St. Paul. We’ve barely scratched the surface of new museums that have opened recently, and yet some might be reaching the point of museum fatigue. (Not another museum exhibit, mom!) The Washington, D.C.-based Institute of Museum and Library Services estimated in 2014 that there were 35,000 or so museums in the United States, double the number since 1990. The question then becomes: When so many rely on private funding, can all of them be supported under such rapid growth? The answer, sadly, appears to be no. In addition to institutions that opened or expanded last year, there were others that closed their doors temporarily or for good, which could be an indicator of limits. “It’s simply a matter of not being able to raise enough revenues,” said Michael DiBerardinis, former city manager of Philadelphia, who had attempted to help the Philadelphia History Museum stay in operation through a takeover by Temple University until the latter pulled out of the deal in June last year. The museum, which had first opened in 1938, contained a collection of more than 100,000 objects spanning the city’s history from 1682 to the present. What will become of its collection is in the process of being determined, DeBerardinis said. Some of these now-shuttered museums were oriented toward those with highly specialized tastes, such as McClain’s Historical Military Armor Museum in Anderson, Indiana, which had displayed a collection of tanks and other military vehicles since 1990, and the Beloit Angel Museum in Wisconsin, which exhibited angel figurines for close to 20 years. In both instances, there were shortfalls of operating funds, memberships and corporate sponsorships; the Military Armor Museum owed back taxes, since it never quite qualified as a nonprofit.